2017 LPOIC K&K Annual Spring Derby is Coming Up! 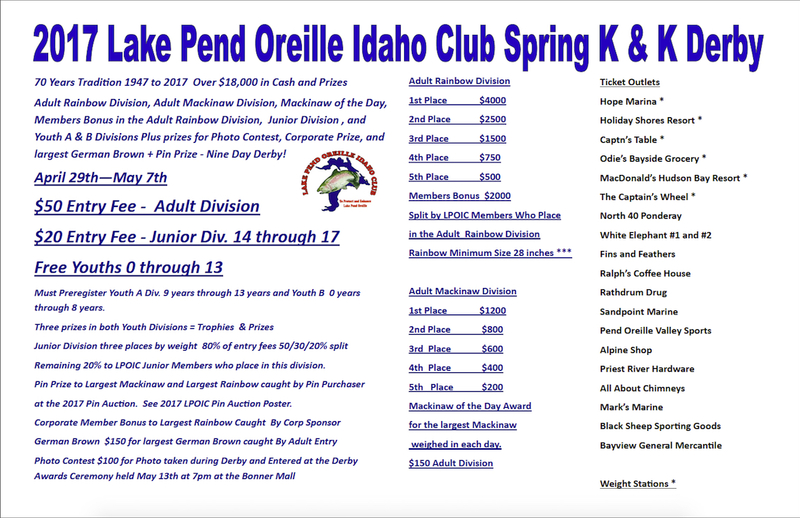 Lake Pend Oreille Idaho Club (LPOIC) is looking forward to an awesome year of fishing and cannot wait to get out on the water this year. We should see a lot of nice fish caught and we are prepared. We now have a 50lb. scale calibrated on the lake in anticipation. Good luck to everyone and hope to see you at the Annual Pin Auction coming up April 28th at the Elks Lodge in Ponderay. Lots of good prizes being auctioned off and a great new pin this year. AND, Wow! Look at the prize packages being offered. Don’t forget that LPOIC meets every 2nd and 4th Wednesday of the month at Connies Cafe in Sandpoint. Come be a part of the fun.